Our 2013 Honda Civic LX is very clean and well taken care of. The "Alabaster Silver" exterior is in excellent condition paired with an odor free light grey cloth interior. 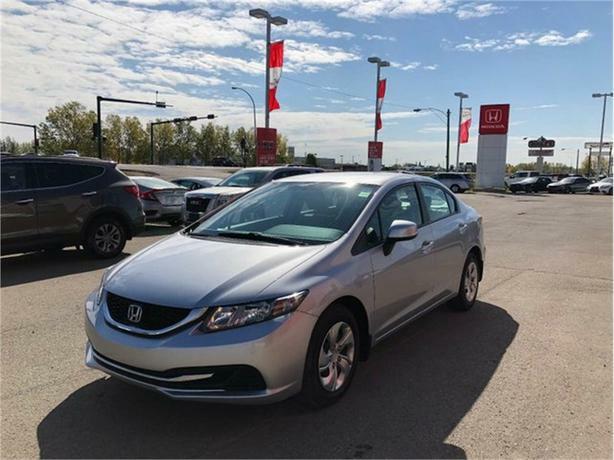 This civic has the LX trim level which gives the driver and passengers many practical features. With a 1.8L 4-cylinder engine you are sure to appreciate the 6.0L/100KM on the highway. This Civic has been regularly serviced and maintained. For your peace of mind, our certified technicians performed an extensive multi-point, comprehensive used vehicle inspection on this vehicle. At this time other than a (B,1) service which is part of Honda Scheduled maintenance, nothing more was needed to ensure this quality FWD is in optimal driving condition and more than ready for its next proud owners! The (B) service includes: Oil & filter change, Comprehensive front & rear brake service, Tire rotation, inspection & pressure adjustment, check for: All fluid levels, Condition of fluid, Leaks and Expiration date for Tire Repair Kit (if equipped). Full inspections of: Parking brake adjustment, Tie rod ends, Steering gear box & boots, Suspension components, Driveshaft boots, Brake hoses & lines (including ABS), Exhaust system and Fuel lines & connections. The (1) sub service is a rotate of the tires. Our Civic is loaded with all those practical features such as; cloth heated front seats, a central display screen as well as a rearview camera. Bluetooth phone and audio connectivity, SMS text messaging functionality and a six-speaker sound system with a CD player, an auxiliary audio jack, an iPod/USB audio interface and Pandora radio functionality will keep you safely connected and entertained as you enjoy the ride of this fantastic Sedan.